Each communication style is equally important and valuable. However, a particular style might be more effective in a given situation. If you’re trying to brainstorm, an Expresser style is valuable. If you’re trying to explain a process to a group of engineers, a Thinker style is valuable. 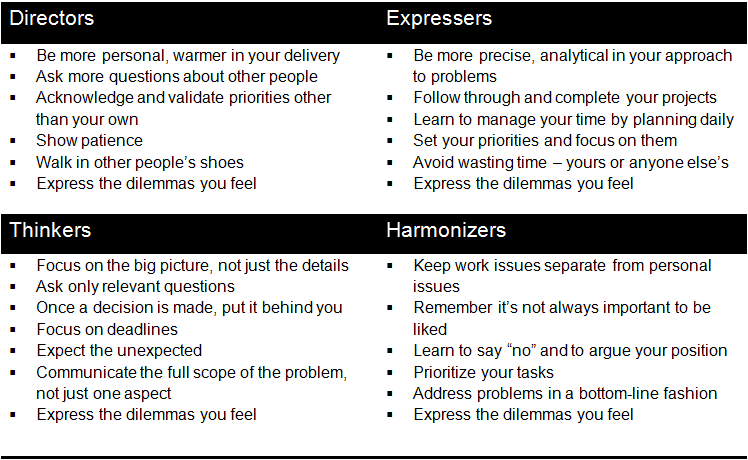 If you want to build trust, a Harmonizer style is useful. If you’re trying to deal with a crisis, a Director style can be valuable. You can “flex” other styles as you would a muscle. 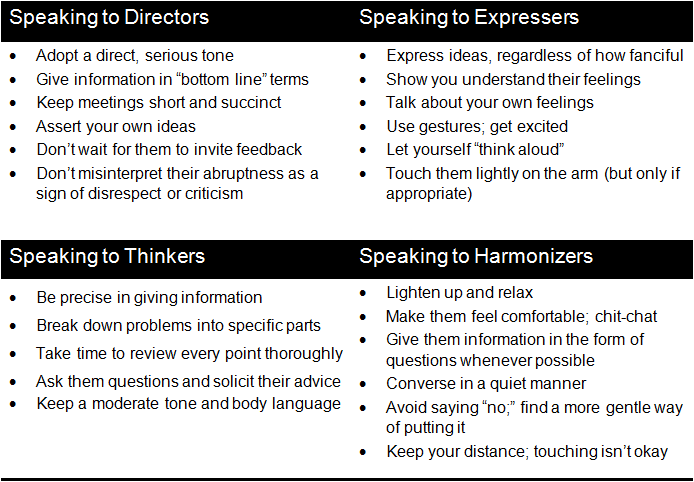 The more you practice flexing different styles in communication with other people, the stronger a communicator you become. Some people find adopting a different style to be unnatural. And it can be. The trick is to act yourself into a way of believing. By adopting the body language, the style of speaking, the mannerisms of a particular style, you will find it less of a stretch than you think. 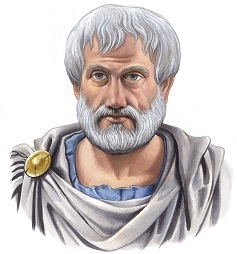 The Greek philosopher Aristotle espoused a simple philosophy of life. Being too courageous meant you were foolhardy. Being too talkative, you were a gossip. If you were too quiet, you were a recluse. The best course lay in the center. The Matrix has a law of the center, too. Here’s how it works: Put your finger on one of the four middle styles. You’ll see that your finger is surrounded by eight different styles. Therefore, if you occupy a middle square, you are adjacent to eight different styles without moving at all. Now touch one of the corner styles. Your finger is surrounded by only three other styles. By touching the mid-perimeter styles, you’ll see they border on five styles. What does this mean? If you need to communicate frequently with many different styles, then it helps to modify your style toward the center of the Matrix. The Rule of the Center is simply a formula for being successful in many different settings with many different people. If you’re not already there, the Rule of the Center will initially seem uncomfortable. 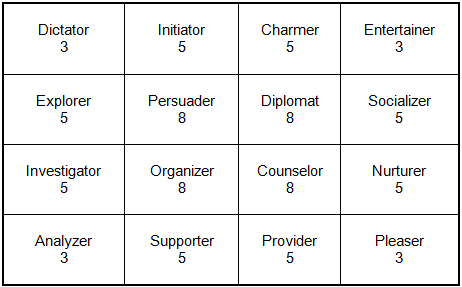 For example, if you are an Initiator who moves toward Organizer, there will be a period of adjustment. After all, it’s contrary to your nature to think things over and ask questions before you speak your mind. But as your symbolic step begins to pay off, the inner discomfort will disappear. Modifying your style of communicating will ensure a clearer line of communication between you and another person. Once you know someone’s place on the Matrix, a single step can mean the difference between a conversation that falters, and one that exceeds your expectations. Some people find adopting a different style to be unnatural. And it can be. The trick is to act yourself into a way of believing. By adopting the body language, the style of speaking, the mannerisms of a particular style, you will find it less of a stretch than you think. People who learn how to modify their styles with each other can form permanent changes in their relationship. Often it helps to codify this change in the form of ground rules for each person. Most of the time, these ground rules need not be brought up. But if a touch subject is on the table, it can benefit both parties to review the ground rules first. 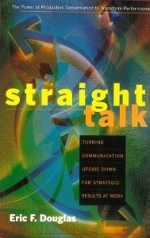 Master communicators can flow easily from one style of communicating to another. Often their natural style lies somewhere in the center of the Matrix. While not everyone needs to be a master communicator, managers and leaders will invariably benefit by learning how to effortlessly shift from one style to the next.